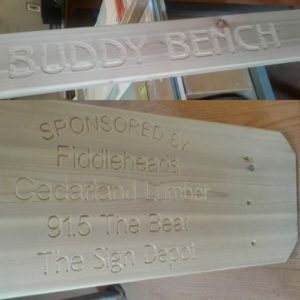 The month of June was beyond busy with our cottage sign segment of the business, but we still take time to be involved in our community and find ways to learn about new ideas. Earlier this month The Centre for International Governance held an advance screening of the film THE SOCIAL SHIFT along with a Q&A with the creators of the film, Meaghan and Marie Wright of Mirror Image Media. Many in attendance were new to the concept of Social Enterprise and the positive effects it has on a community. The creators summed it up well when it was stated that many business owners wait until they retire and then become philanthropists. In reality they could be creating businesses that “do good” as their mandate, which then would be referred to as a social enterprise. You can learn a bit about social enterprises in Canada by viewing the film’s trailer below. Throughout the filmed the audience learned about Canadian businesses that assist with environmental change, companies created that gave people a place to work and taught them new skills with a chance for advancement and so many many other ideas that help both locally and globally. Last month we spoke about our community involvement with the BUDDY BENCH project. Since then we been able to work on other signage that promotes inclusivity and social change. One was a donor recognition feature at St. Paul’s University College along with signage for their Greenhouse social impact incubator. 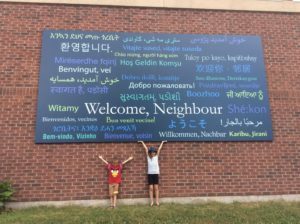 Another project we were proud to be part of was the WELCOME NEIGHBOUR exterior sign created for the Victoria Hills Neighbourhood Association that was revealed at this year’s Neighbours Day. As you have noticed in earlier posts we also enjoy being involved in our community, whether it be at sponsoring events or attending events like this above mentioned screening to see how we can be innovative with the way we make our signs and source our materials. For example our preferred metal provider donates and holds fundraisers for the Make a Wish Foundation, which is why we buy from them. When businesses take a look at how they run their company and the businesses they choose to work with they can learn how they can make a social impact. Even small tweaks can provide lasting results and social change. I am looking at creating a very pretty wooden outdoor signage for my cake studio. Please let me know if you do this. I am looking a free standing wooden white signage to be put on the front lawn of my heritage house which has been zoned for home business. Have you done any of these. I am looking at a very creative and unique sign that would attract passer bys. You can contact me at 4168168270 Thanks. Please email sales@sign-depot.on.ca with the info and I can connect you with someone for a quote.